By acquiring SABMiller, InBev would gain significant market share in Africa, where beer sales are expected to grow in the coming years. To do that, the merged companies would likely have to divest themselves of holdings in the U.S., where the control a combined 70% of the beer market. After SABMiller rejected a $100 billion takeover offer from Anheuser-Busch InBev, the world’s biggest beer company has come forward with a sweeter offer of $104 billion. 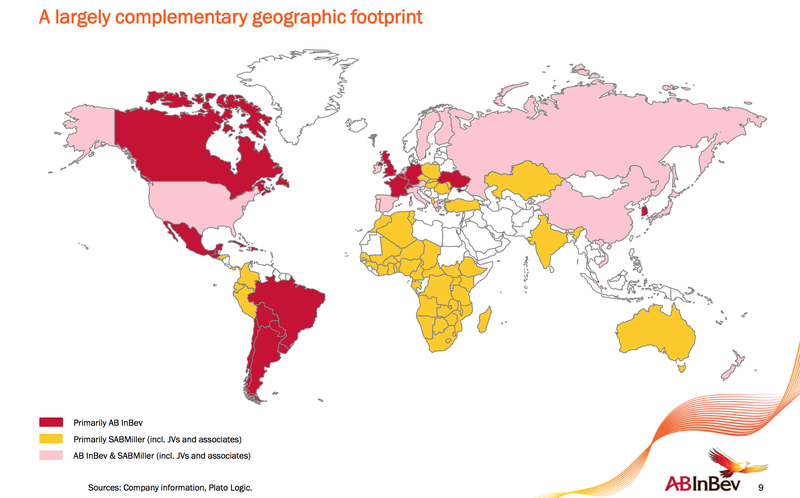 In the above map, released by AB InBev as part of its presentation [PDF] for today’s announcement, you can see how adding London-based Miller would give the combined companies a truly global presence. Where a merged InBev/Miller may have trouble are the countries — like the U.S., Russia, and China — where both companies already have a significant presence. In America alone, the merged company would control around 70% of the beer market. SABMiller, whose chairman Jan du Plessis describes his company as “the crown jewel of the global brewing industry,” is not exactly impressed with even the slightly higher offer. But whether the merger happens may be up to the two largest shareholders of Miller — tobacco giant Altria, and the Santo Domingo family of Colombia. Together, the control around 40% of SABMiller. AB InBev has stated that it expects to receive public support from the Santo Domingo family as well.